If you are a long term snorer you should probably be aware of the health risks that snoring can cause if you ignore it over a serious period of time. Like many, you may wish to stop your snoring for several reasons – to take care of your health, marital harmony (i.e. not waking your partner several times a night), or even to (for once) wake up feeling refreshed after a good night’s sleep. The most popular, effective and inexpensive way to stop your snoring is by using stop-snoring mouthpieces. There are a number of highly effective mouthpiece devices that are available on the market today that will stop your snoring, of course. The most popular types are mandibular adjustment devices (MAD). These work by moving the lower jaw slightly forward compared to the upper jaw. This prevents the tongue from slipping back and blocking the airway while you are asleep. It is this tongue blockage which usually causes the snoring sound. One of the problems with these devices is that they are generally unsuitable for people who wear dentures, crown or bridges. Recent teeth implants can also be problematic with them. This is due to most MADs relying on the teeth to hold the mouthpiece in place while the lower jaw is extended beyond the upper. This causes constant strain on dentures and other dental enhancements that can cause distortions. You do NOT want distortions. In a study carried out and published in the Journal of Dental Sleep Medicine (JDSM), on May 10, 2015, a trial was undertaken by a group of patients who snored and could not use standard MADs. The dental surgeons made specially designed dentures that could be worn and work with a MAD type mouthpiece. The results show that these devices were very effective and improved sleep and oxygen levels. This is a very recent development and is probably some time away from being available and probably at a high financial cost. Tongues stabilizing devices (TSD) are a type of stop snoring mouthpiece available today that can offer effective results at stopping snoring for denture wearers (as well as other people who have conditions that prevent them from wearing a typical MAD mouthpiece at night). The snore stopping purpose behind the TSD is the same as for the MAD: to stop the tongue from slipping back into the throat when asleep. The TSD uses a different method that does not rely on teeth to hold it in place. Also, it does not alter the position of the jaw. TSDs work by attaching to the tongue using suction and then pulling the tongue forward to keep the airway open. Unlike MADs, TSDs do not rely on the device being held in place with the teeth. On the other hand, if you are unable to breathe through your nose comfortably, then a TSD is going to be unsuitable for you. If you suffer from a blocked nose from conditions such as colds or allergies, do not use a TSD until you are able to comfortably breathe through your nose again. TSDs are relatively new and there are not many options available at present, basically the key mouthpiece is the Good Morning Snore Solution, or GMSS (review is here). Both the GMSS and the more rare and difficult to purchase Aveo TSD are made of medical grade, BPA free silicone. They both work by attaching themselves to the tongue using suction. TSDs require a little time to get used to and it is recommended that they be worn for short periods before going to bed to get your mouth used to them. The Good Morning Snore Solution (GMSS) is currently the most well-known and popular TSD. The GMSS was developed by Dr. Nancy Markley from Alberta, Canada. 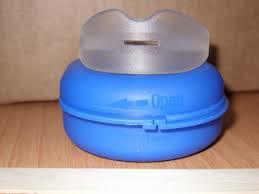 It works by attaching to your tongue using suction with the large majority of the mouthpiece worn outside of the lips. This pulls your tongue forward. The first thing that you should be aware of is that, unlike many devices, the GMSS has actually undergone clinical trials (a summary is available on their website), so there is actual data supporting their claims of effectiveness. GMSS also offers a 30 day money back guarantee. If you are not satisfied with the results while using the GMSS you can get a full refund less shipping and handling charges. The caveat there is that you are responsible for paying to return the GMSS mouthpiece. The GMSS is recognized by the FDA, Health Canada and the European Union as a suitable device for treating mild to moderate sleep apnea. There are possible physical side effects in the early days of wearing the GMSS TSD. These include a slight soreness to the tip of the tongue and excessive salivation. These will subside as you become used to this mouthpiece. The Aveo TSD works in a similar way to the GMSS device in that it also attaches to your tongue by suction. Unfortunately in many countries, the US included, the Aveo TSD is only available by prescription for doctors or dentists and cannot be bought online. The lack of availability alone makes this mouthpiece an iffy purchase, at best. Every time that you need a new one, you will need to go through your doctor or dentist. And here’s the kicker – despite some time spent in researching I have been unable to find a cost for the device in the US. Aveo TSD does not offer a satisfaction guarantee. Like the GMSS device there are possible initial physical side effects such as a soreness to the tip of the tongue and excess salivation. Again these will eventually disappear as you become used to the device. Of the two TSDs mentioned above I would suggest that the first one to try would be the GMSS. The GMSS is recommended because of its track record of effectiveness, easy availability, cost certainty, and, if it doesn’t work for you, you can get a full refund. Some MAD manufacturers suggest that their devices are suitable for denture wearers. In some cases this may be true, as long as you do not have a full set. However, if you do have dentures it is recommended that you talk to your dentist first before you use any MAD mouthpiece. It will be worth the consultation, without a doubt. What device would be best for someone who soaks their Dentures every night and don’t sleep with them? You’ll want to check out the Good Morning Snore Solution. will gmss work with no teeth or dentures? Yes, Paul. I have heard from such patients, and they confirm that unlike other MAD mouthpieces, you can use the GMSS without teeth. This is mainly because you don’t have to bite down, which you have to do with nearly every other mouthpiece. Will it work if you sleep with Dentures? The answer is yes. The GMSS is the only mouthpiece we recommend for snorers with dentures. Can a mad be altered when you get a new implant on the side. The current dentist is not the one who originally fit my devise. Hi Tonya. Well, the SnoreRX does allow for a good range of adjustment, but if dental work is your issue, GMSS might be your only shot. Either way, both have long trial periods so if they don’t work, send ’em back. 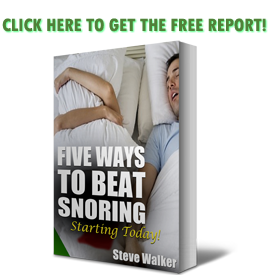 Snoring is quite a common problem. But for denture wearers, this problem is bigger than most, at least from what I’ve seen. There are options available for them, and it is very good thing. Thanks. After reading this post, at least people know they have a solution.